ONE RIVER POINT WILL BECOME THE SKYLINE-DEFINING STATEMENT OF MIAMI’S RIVERSIDE RENAISSANCE. PROVING THAT LANDMARK LUXURY IN MIAMI DOESN’T HAVE TO BE BUILT ON SAND. 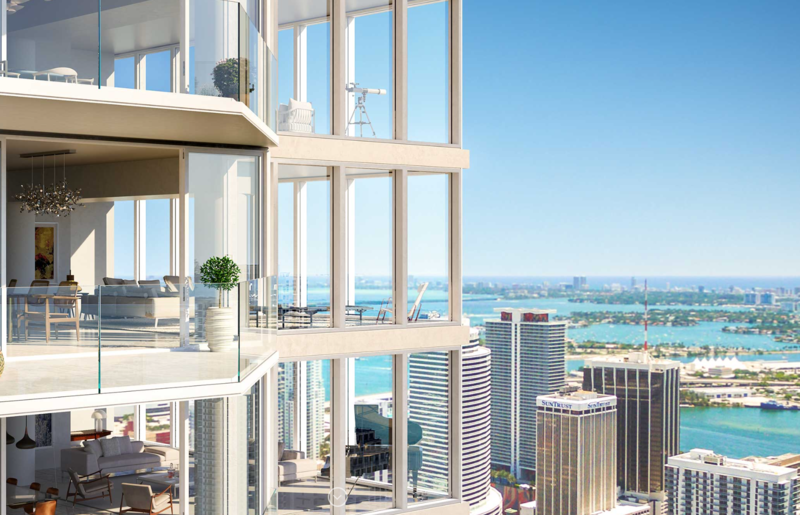 One River Point brings Viñoly’s concept of architecture as performance dramatically to life. Two soaring symmetrical towers join in a stunning glass Skybridge 800 feet above the Miami River. Affording unrivalled vistas of river, downtown, bay and ocean beyond, it achieves a unique synthesis of art and nature in one standout architectural statement. Riverside park. Residential resort. Exclusive club. Dramatic Skybridge. Each element delivers a distinctive living experience. Combined they create a truly unique destination. Superbly-serviced living, seamlessly delivering year-round luxury boutique experience. An experience that awaits you from the moment you are greeted by staff behind a cascading wall of water. The private riverfront elevated podium, centered around the infinity pool, creates an outstanding resort environment for residents’ exclusive enjoyment. One River Point is perfectly located to access Miami’s most exciting cultural and lifestyle attractions, as well as major transport links. The Metro Mover and South Miami Avenue run alongside the development. South Beach is a few minutes drive away, and Miami’s International Airport can be reached in under 15 minutes by car. BREATHTAKING VIEWS WITH ELEGANTLY EXPANSIVE LIVING, BEAUTIFULLY APPOINTED THROUGHOUT. Space, light, spectacular views and uncompromising luxury as standard. Two dramatic glass-fronted living spaces, set floating 800 feet above the river, affording unsurpassed panoramic vistas. uninterrupted 360 vistas and deep-set private terraces.